and noted for its wildlife parks and sanctuaries – it is nature at its best. Here are some of the reasons you may want to move to this wonderfully diverse city. 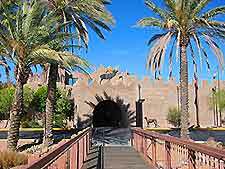 While Arizona is in the Southwest area of the United States, Tucson is an hour drive from the Mexico border and about one and a half hours drive from Phoenix. Its Native American history is well-known and an integral part of this city. Included in downtown Tucson are a myriad of historic and cultural areas where you can spend your time engaging in such amenities as: the performing arts including the arts district; theater; opera; ballet and symphony. In addition, you will well-known landmarks such as St. Augustine Cathedral, Hotel Congress, and more. For the nature lover, you can walk among the Tucson Botanical Gardens which has a plethora of native plants and birds. Shopping, restaurants, nightlife and a wide variety of amenities await you. If you retire to Tucson, it could an adventure. Talk about history! Tucson is filled with historical buildings and places you may want to check out. Hotel Congress, for example, was where the infamous John Dillinger stayed in 1934; Carrillo Intermediate School was the site where Theodore Roosevelt spoke in 1912; Southern Pacific Railroad station is noted as the place where Wyatt Earp made history; and these are just the tip of the iceberg! Once you retire to Tucson, you will never run out of things to do. Whether you enjoy the fine arts; golf; spas; museums; outdoor activities; hiking; or just basking in the sun – this is one city where you can participate in a treasure trove of activities on a daily basis. Moreover, Tucson has a wide range of services to assist you in relocation. What other place can you think of that encompasses so much history and culture in one city? to include qualified current homeowners looking to purchase a home. Click here for more information or visit: FederalHousingTaxCredit.com.